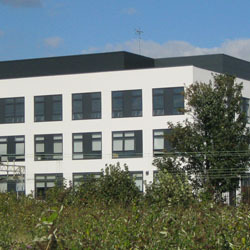 Wetherby have been heavily involved in many of the recent BSF educational new build projects and have devised insulated render solutions for an array of complex architectural structures. By their nature, schools and colleges of the past were generally inefficient in terms of energy conservation, because they were constructed of thermally poor building materials and/or they were heated using archaic equipment. 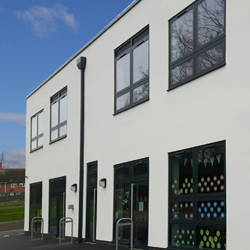 Many of the new schools, colleges and academies that have been built in recent years have taken advantage of more modern building methods, such as steel frame, timber frame, SIPS panels or the newly popular modular/ offsite construction. These designs allow for highly efficient thermal insulation system to be installed on the outside of the property, before a weather proof, decorative finish is applied. This type of system prevents heat from escaping in the winter months, yet also keeps the building cooler in the summer months, ensuring maximum comfort for students & staff. 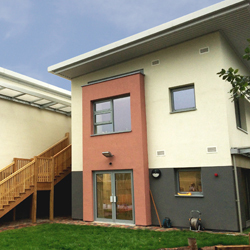 Click to see our innovative external facade systems for modular / off-site construction methods, incorporating brick slips or silicone/ acrylic render.